If all men by nature desire to know, then they desire most of all the greatest knowledge of science. John Duns Scotus (c. 1266 – 8 November 1308) is generally reckoned to be one of the three most important philosopher-theologians of the High Middle Ages. As for the object of the science in this sense, we have indicated above that this science is about the transcendentals. And it was shown to be about the highest causes. But there are various opinions about which of these ought to be considered its proper object or subject. I say that some things can be said to belong to the law of nature in two ways: One way is as first practical principles known from their terms or as conclusions necessarily entailed by them. These are said to belong to the natural law in the strictest sense, and there can be no dispensation in their regard... But this is not the case when we speak in general of all the precepts of the second table. For the reasons behind the commands and prohibitions there are not practical principles that are necessary in an unqualified sense, nor are they simply necessary conclusions from such. For they contain no goodness such as is necessarily prescribed for attaining the goodness of the ultimate end, nor in what is forbidden is there such malice as would turn one away necessarily from the last end, for even if the good found in these [precepts] were not commanded, the ultimate end could still be loved and attained, whereas if the evil proscribed by them were not forbidden, it would still be consistent with the acquisition of the ultimate end. “There appears to be a fifth way, that of eminence. According to this I argue that it is incompatible with the idea of a most perfect being that anything should excel it in perfection (from the corollary to the fourth conclusion of the third chapter) . Now there is nothing incompatible about a finite thing being excelled in perfection; therefore, etc. The minor is proved from this, that to be infinite is not incompatible with being; but the infinite is greater than any finite being. Another formulation of the same is this. That to which intensive infinity is not repugnant is not all perfect unless it be infinite, for if it is finite, it can be surpassed, since infinity is not repugnant to it. But infinity is not repugnant to being, therefore the most perfect being is infinite. The minor of this proof, which was used in the previous argument,  cannot, it seems, be proven a priori. For, just as contradictories by their very nature contradict each other and their opposition cannot be made manifest by anything more evident, so also these terms [viz. "being" and "infinite"] by their very nature are not repugnant to each other. Neither does there seem to be any way of proving this except by explaining the meaning of the notions themselves. "Being" cannot be explained by anything better known than itself. "Infinite" we understand by means of finite. I explain "infinite" in a popular definition as follows: The infinite is that which exceeds the finite, not exactly by reason of any finite measure, but in excess of any measure that could be assigned.— The following persuasive argument can be given for what we intend to prove. Just as everything is assumed to be possible if its impossibility is not apparent, so also all things are assumed to be compatible if their incompatibility is not manifest. Now there is no incompatibility apparent here, for it is not of the nature of being to be finite; nor does finite appear to be an attribute coextensive with being. But if they were mutually repugnant, it would be for one or the other of these reasons. The coextensive attributes which being possesses seem to be sufficiently evident.— A third persuasive argument is this. Infinite in its own way is not opposed to quantity (that is, where parts are taken successively); therefore, neither is infinity, in its own way, opposed to entity (that is, where perfection exists simultaneously) .— If the quantity characteristic of power is simply more perfect than that characteristic of mass, why is it possible to have an infinity [of parts] in mass and not an infinite power? And if an infinite power is possible, then it actually exists (from the fourth conclusion of the third chapter).— The intellect, whose object is being, finds nothing repugnant about the notion of something infinite. Indeed, the infinite seems to be the most perfect thing we can know. Now if tonal discord so easily displeases the ear, it would be strange if some intellect did not clearly perceive the contradiction between infinite and its first object [viz. being] if such existed. For if the disagreeable becomes offensive as soon as it is perceived, why is it that no intellect naturally shrinks from infinite being as it would from something out of harmony with, and even destructive of, its first object?" There had been implanted along through the ages germs of another growth in human thinking, some of them even as early as the Babylonian period. In the Assyrian inscriptions we find recorded the Chaldeo-Babylonian idea of an evolution of the universe out of the primeval flood or "great deep," and of the animal creation out of the earth and sea. This idea, recast, partially at least, into monotheistic form, passed naturally into the sacred books of the neighbors and pupils of the Chaldeans—the Hebrews; but its growth in Christendom afterward was checked, as we shall hereafter find, by the more powerful influence of other inherited statements which appealed more intelligibly to the mind of the Church...In the minds of Ionians like Anaximander and Anaximenes it was most clearly developed: the first of these conceiving of the visible universe as the result of processes of evolution, and the latter pressing further the same mode of reasoning, and dwelling on agencies in cosmic development recognized in modern science. ...Aristotle sometimes developed it in a manner which reminds us of modern views. ...Lucretius caught much from it extending the evolutionary process virtually to all things. ...Scotus Erigena and Duns Scotus, among the schoolmen, bewildered though they were, had caught some rays of this ancient light, and passed on to their successors, in modified form, doctrines of an evolutionary process in the universe. ...In the latter half of the sixteenth century these evolutionary theories seemed to take more definite form in the mind of Giordano Bruno... but with his murder by the Inquisition at Rome this idea seemed utterly to disappear. 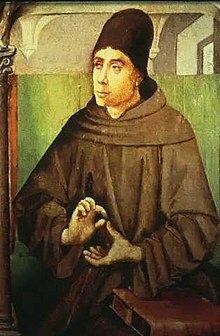 Stanford Encyclopedia of Philosophy: "John Duns Scotus"
Internet Encyclopedia of Philosophy: "John Duns Scotus"
This page was last edited on 18 September 2017, at 08:51.